Charlie Burchill guitarist and keyboard player with Scottish rock band Simple Minds was Born 27th November 1959. Simple Minds achieved worldwide popularity from the mid-1980s to the early 1990s and continue to tour in the new millennium. The core of the band is the two remaining founder members – Jim Kerr (vocals, songwriting) and Charlie Burchill (guitars, keyboards after 1990, other instruments, songwriting) – and drummer Mel Gaynor (who first joined the band in 1982). The other current band members are Andy Gillespie (keyboards) and Ged Grimes (bass guitar). Significant former members include bass guitarist Derek Forbes and keyboard player Michael MacNeil (the latter credited as a significant band composer during the band’s rise in the 1980’s. Considered to be the greatest guitarist in popular music, The late great James Marshall “Jimi” Hendrix (born Johnny Allen Hendrix) was born on this date November 27, at Seattle’s King County Hospital, in 1942. He is Widely hailed by music fans and critics alike as the greatest electric guitarist of all time, and remains the most influential rock guitarist and songwriter in recording history. He was influenced by blues artists such as B.B. King, Muddy Waters, Howlin’ Wolf, Albert King and Elmore James, rhythm, blues and soul guitarists Curtis Mayfield and Steve Cropper, and the jazz guitarist Wes Montgomery. Hendrix was mostly self-taught on the guitar. He was ambidextrous but chose to play the guitar upside-down and re-strung for playing left-handed, which suggests that he was more comfortable left-handed. As a guitarist, he built upon the innovations of blues stylists such as B.B. King, Albert King, Buddy Guy, T-Bone Walker, and Muddy Waters, as well as those of rhythm and blues and soul music guitarists such as Curtis Mayfield. Hendrix’s music was also influenced by jazz; he often cited Rahsaan Roland Kirk as his favourite musician. In addition, Hendrix extended the tradition of rock guitar; although previous guitarists, such as The Kinks’ Dave Davies, Jeff Beck, and The Who’s Pete Townshend, had employed techniques such as feedback, distortion and other effects as sonic tools,Hendrix was able to exploit them to a previously undreamed-of extent, and made them an integral part of his own private, unique genre, which he called “Red”. 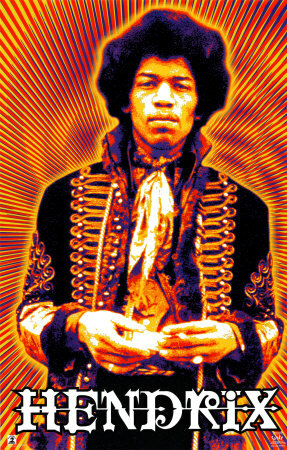 The Hendrix sound combined high volume and high power, feedback manipulation, and a range of cutting-edge guitar effects, especially the UniVibe-Octavia combination, which can be heard to full effect on the Band of Gypsys’ live version of “Machine Gun”. He was also known for his trick playing, which included playing with only his right (fretting) hand, using his teeth or playing behind his back, although he soon grew tired of audience demands to perform these tricks. As a record producer, Hendrix was an innovator in using the recording studio as an extension of his musical ideas. Hendrix was notably one of the first to experiment with stereo effects during the recording process. Hendrix was also an accomplished songwriter whose compositions have been performed by countless artists. At Woodstock, Larry Lee was a member of Hendrix’ Band of Gypsies, and also played a Gibson Les Paul Studio model and sung with Hendrix as well. During his lifetime Hendrix won many of the most prestigious rock music awards, and has been posthumously awarded many more, including being inducted into the US Rock and Roll Hall of Fame in 1992 and the UK Music Hall of Fame in 2005. An English Heritage blue plaque was erected in his name on his former residence at Brook Street, London, in September 1997. A star on the Hollywood Walk of Fame (at 6627 Hollywood Blvd.) was dedicated in 1994. In 2006, his debut US album, Are You Experienced, was inducted into the United States National Recording Registry, and in 2003 Rolling Stone Magazine named Hendrix the top guitarist on its list of the 100 greatest guitarists of all-time.